Pain in Chest When Swallowing, Why? Swallowing involves several muscles and nerves in your esophagus and pharynx as well as a swallowing center in your brain and several nerves that form a connection between the swallowing center and the esophagus and pharynx. Several problems may arise during the process and leave you with pain in chest when swallowing. The pain can also occur in your neck or throat. Sometimes, you only experience some heaviness or pressure on your chest, but on other occasions, it also accompanies vomiting and regurgitation. You need to identify the underlying cause of chest pain when swallowing to find a right treatment option. 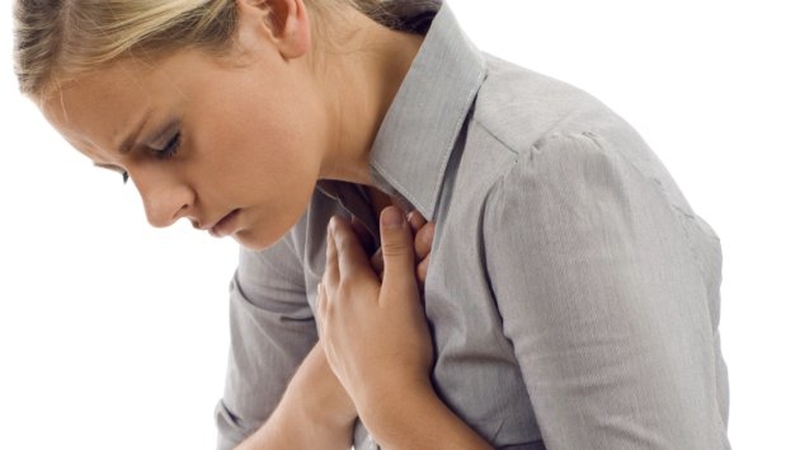 There could be a problem nerves, muscles, etc., that may lead to chest pain when swallowing. Here are some of the most common causes. Your body manages to strip off fluid and food towards your stomach due to organized esophageal motion, which is more of a wave-like muscular activity and is quite coordinated to propel what you eat through esophagus. There will at least 3 successive waves of contraction after you've swallowed something to ensure nothing's there in your esophagus. You may notice incomplete esophageal emptying caused due to esophageal motility disorders, which can lead to pain in chest when swallowing. Nutcracker esophagus is a common disorder that causes painful esophageal spasms experienced right behind your breastbone. You may experience pain in chest when swallowing if your esophagus becomes inflamed. This usually happens due to chronic gastro esophageal reflux disease or GERD. If you're suffering from this disease, you will feel some pain when your burp or swallow something. You may also notice constriction or stiffness of your esophagus due to an immune disorder such as scleroderma, which will also make you say, "My chest hurts when I swallow". You can injure the inner walls of your esophagus by swallowing something irritating or sharp. Minor injuries won't need any treatment and they will heal on their own, but you may still experience pain for some days – you experience pain even when you burp. GERD may also lead to esophageal injuries in some cases and that often causes chest pain while swallowing. Issues like acid reflux or bad heartburn may lead to the inflammation of esophagus. You experience pain when acid leaves your stomach to enter your esophagus. Sometimes, the medications you use irritate your esophagus – the condition is called pill esophagitis. This is quite common for people using the bisphosphonates, used mainly to protect bone density. Certain fungal or viral infections may also be the underlying cause of inflammation of your esophagus, which make you feel pain in chest when swallowing. It refers to the diseases of the muscles of your gastrointestinal tract (stomach, esophagus, large and small intestines) in which specific muscles stop working normally. The condition is also referred to as chronic intestinal pseudo-obstruction or gastro paresis. If you have this syndrome, you will not be able to move food through your intestines and stomach, which will ultimately be causing pain. If you always feel as if the food is stuck in your chest or throat, you have problem swallowing it, or even choke on foods, you may have developed an esophagus cancer. The cancer may become large enough to restrict any food from passing without causing pain. You usually notice pain a few seconds after you swallow something. If you didn't find answer to "Why my chest hurts when I swallow?" here are some other causes to consider. Your swallowing problems could be due to infections, such as thrush, HIV, sore throat, herpes simplex virus, cytomegalovirus and gingivitis. It could also happen due to issues related to the esophagus, such as achalasia and ulcer in the esophagus. Besides, throat ulcers, tooth infection, and abscess are other common causes of pain in chest when swallowing. You can take certain homecare measures to deal with pain that is mild, temporary or bearable. For starters, eat slowly and be sure to chew your food well. Switch to pureed foods if you find it difficult to swallow solid foods. Avoid too hot or too cold foods if they aggravate your symptoms. Similarly, you should avoid foods that promote reflux, such as spicy foods, caffeine, peppermint, acidic foods, and fried foods. Don't lie down immediately after eating. Take at least 3 hours before you lie down. Stop smoking to avoid dealing with chest pain while swallowing. Stop drinking alcohol or limit alcohol intake to improve your condition. Be sure to keep your body hydrated if you have a fever. Note: You should go see your doctor if you have pain in chest when swallowing with other symptoms such as lightheadedness, bloody stools, weight loss, fever, chills, abdominal pain, heartburn, wheezing, nausea and sour taste in the mouth. When home remedies don't work, you may have to opt for a medical procedure to treat your problem. Your doctor may recommend one of the following treatment options depending on the cause and the severity of your symptoms. Your doctor will use antibiotics if your chest pain when swallowing is due to tonsil infections, throat infections, esophageal infections or infections within the mouth. Sometimes, you will find it painful to swallow the antibiotic. In this case, your doctor will first ask you to use a numbing agent, like mouthwash, and then take your antibiotics. The numbing agent will block the pain and make it easy to swallow the pill. A throat spray is also a good choice here. Any esophageal swelling caused by acid reflux will respond well to OTC antacids. You may have to consult your doctor if you have chronic acid reflux because they will prescribe specific medications in this case. You may have to go for chemotherapy or radiation therapy if your chest pain is due to cancer.